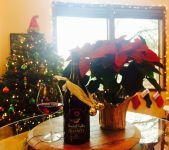 Why go to the mall when you can do your holiday shopping at a winery? Join us for our Holiday Sip & Shop and take care of everyone in your list all while enjoying a glass of wine. Winemaker, Ariel Eberle, will be at John's Marketplace to share a handful of Yamhill Valley Vineyards wines with the good people of Portland! Come get to know the winery and the wines and take the opportunity to peruse the wide selection of offerings that John's Marketplace has in stock!